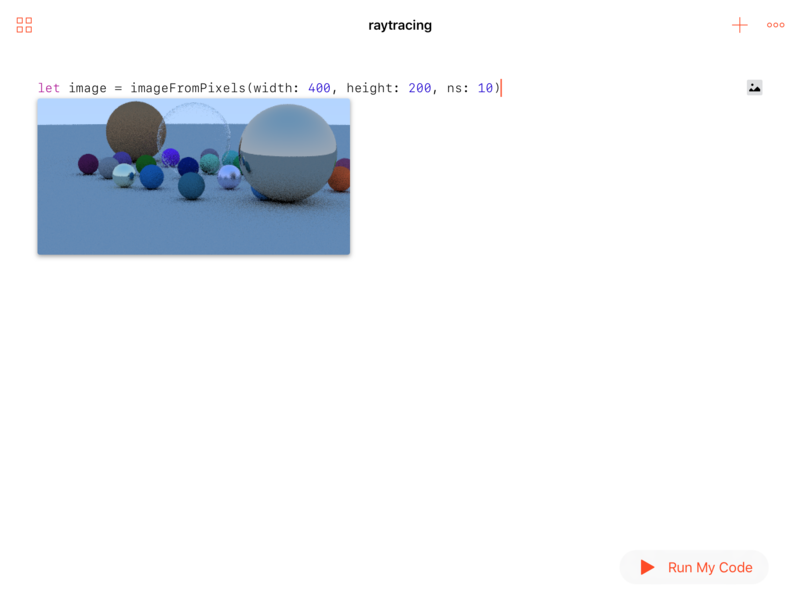 Today, I am looking again at the Ray Tracing project because I wanted to see how it runs in an iPad Playground. There aren’t any changes in the core code for now, except I have updated it to run on iOS 10, Xcode 8, Swift 3 and the new iPad Playground app. In order to get the image to show, you need to tap on the little icon that looks like an image, at the end of the line, and choose Add viewer. You could amp up the resolution to say, 800 x 400, but this will also increase the running time of your playground. However, the output image is worth the waiting! We will soon look at ways to make the playground run faster and generate higher quality output images. My good friend and scientific programming guru, Jeff, is working on a Metal-based version of this raytracer. We will talk about that soon, too. The source code for the playground in this article is posted on Github as usual.